It appears that Colorado anti-fracking activists’ 15 minutes might be up. The scene earlier this week at the monthly Colorado Oil and Gas Conservation Commission (COGCC) meeting was pretty standard, as activists lined up in the hallway waiting to give public comment as part of their monotonous, almost monthly rally against the COGCC. But there was a huge difference between this meeting and the one before it — there were no media cameras to be found. Of course, the anti-fracking activists’ show still went on even without the presence of the media spotlight they so obviously covet. The usual suspects like D.C.-based national anti-fracking group Food & Water Watch (F&WW) were at this past Monday’s COGCC meeting held in Denver, where the same F&WW operative who spoke at the last COGCC meeting used her public comment time at last Monday’s meeting to call for COGCC director Matt Lepore to resign or be fired by Gov. John Hickenlooper. It was a roller coast performance, as some activists were angry and saying things like “shame, shame, shame on all of [COGCC commissioners] you cowards,” while others rallied against the oil and gas industry by delivering a catchy little jingle. See below. 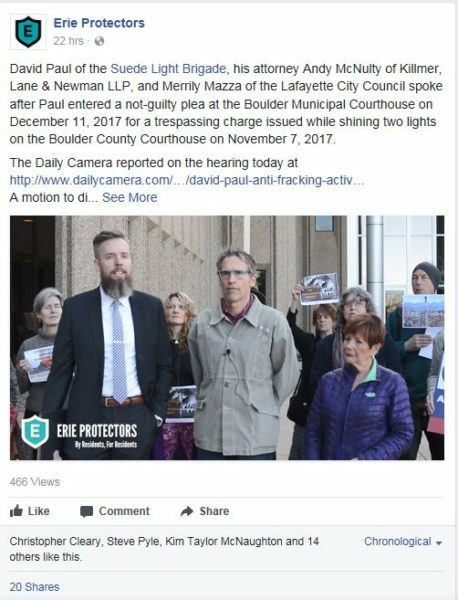 In addition to the lack of media attention at Monday’s COGCC hearing in Denver, anti-fracking activists over in Boulder County hosted a press conference in front of the Boulder County Courthouse regarding a recent incident in which activists tried to show people “the light” as it pertains to fracking, but instead one of the anti-fracking protester ended up lit with litigation instead. The Colorado Business Roundtable weighed in with public comment at Monday’s COGCC meeting, shining a light on what the oil and gas industry means to the broader Colorado economic landscape. The COGCC public meeting further confirms that fracking opponents’ theatrical stunts will continue as they seek out the attention of the media by stepping up the ante every chance they get. Despite anti-fracking activists efforts to upstage members of the business community who spoke at the meeting with their screams, chants, posters, and light shows – Monday’s COGCC meeting proves, cooler heads will always prevail.